As members of an elite band of cosmic explorers, they are among the few to have gone beyond the final frontier and looked down on the Earth from space. Now, inspired by the unique perspective they gained of their home planet – and armed with startling new data about the scale of the threat it faces from asteroid strikes – a group of former Nasa astronauts are on an extraordinary mission to save the world. Fourteen months after an asteroid exploded over Chelyabinsk, Russia, on a scale equivalent to 30 Hiroshima bombs, the B612 Foundation, a non-profit group founded by Apollo 9 astronaut Rusty Schweickart and space shuttle astronaut Ed Lu, are warning that only “blind luck” has so far saved it from worse. “It’s a giant game of chance we’re playing. It’s cosmic roulette,” said Dr Lu, whose group is working towards building and launching Sentinel, a $250 million telescope that would spot space rocks on a collision course with the earth, giving several years or even decades worth of notice to deflect a disaster. “There’s a saying in Vegas that ‘The house never loses’. It’s true; you can’t just keep playing a game of chance and expect to keep winning,” added Dr Lu, the group’s chief executive officer. 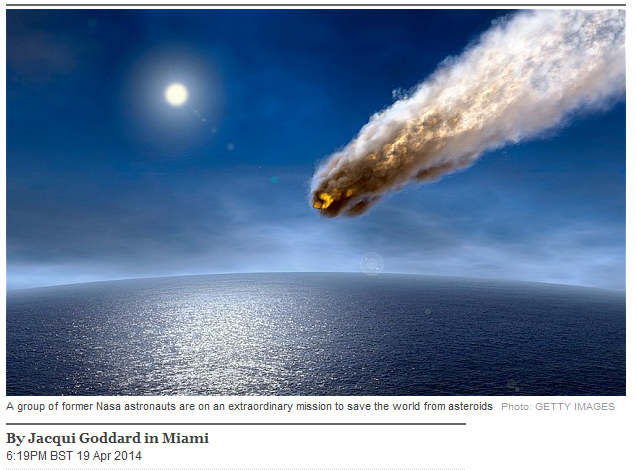 In January, data obtained by Dr Peter Brown, a planetary scientist and asteroid expert at the University of Western Ontario, in Canada, revealed that since 2001 the earth has been struck by asteroids the size of the Chelyabinsk rock – or bigger – 26 times; up to ten times more frequently than previously thought. On Tuesday, which is Earth Day, the B612 Foundation will hold a press conference to unveil more critical details, including a video presentation that will for the first time reveal the locations and sizes of the multi-kiloton impacts. The video is based on information from the International Monitoring System, a network of sensors set up around the world to verify compliance with the global ban on nuclear weapons testing. The technology detects sound waves and shock waves above and below Earth’s surface. Since only 28 per cent of the planet’s surface is land, and only one per cent is populated, the majority of asteroid strikes are in remote regions, deserts and oceans. “The fact that none of these asteroid impacts represented in the video was detected in advance, is proof that the only thing preventing a catastrophe from a ‘city-killer’ sized asteroid is blind luck,” said Dr Lu, who flew three space shuttle missions and served a six-month stint aboard the International Space Station during his 12-year Nasa career. The Chelyabinsk asteroid ripped through the earth’s atmosphere as a 42,000mph fireball, exploding nearly 19 miles (30kms) above the ground. It damaged 7,200 properties in six cities and injured 1,500 people across a 26-mile radius. In an uncanny coincidence, astronomers’ attention was to have been focused that day on another asteroid – a 45 metre-wide rock tagged DA14 – which had been identified through ground-based telescopes one year previously as being on a “near miss” trajectory towards the earth. But just 16 hours before DA14 made its closest approach, passing by the planet at a distance of 17,200 miles, came Chelyabinsk’s unexpected visitor, a 65-foot wide rock weighing more than the Eiffel Tower. It had gone undetected for years because it came from the same direction as the Sun’s glare, making it impossible for ground-based optical telescopes to see it. Sentinel, which the B612 Foundation is aiming to launch in 2018, will be positioned up to 170 million miles from the earth, near Venus, from where its lenses would point away from the Sun. In the first month of operation alone, it is expected to detect and track more than 20,000 near-Earth asteroids, exceeding the discoveries made by all other telescopes combined over the course of the last 30 years. Over six and a half years, it will make an inventory of 98 per cent of near-Earth asteroids; the current detection level stands at only one per cent. Mr Schweickart, who as an astronaut on Nasa’s Apollo 9 mission in March 1969 played a critical role in paving the way for man’s first landing on the Moon four months later, co-founded the B612 Foundation and now serves as chairman emeritus. The group first worked on designing technologies to deflect asteroids from collisions with Earth, before launching the Sentinel early-warning project. It is having to raise the $250 million to build Sentinel, and the further $200 million to operate it for 6.5 years, itself. The failure by the US government to do the job itself irks Schweickart. “Scientific projects such as understanding that there’s an ocean under the ice on Europa is a really wonderful thing, but it shouldn’t compete in terms of government funding priorities with ensuring the safety and security of people here on Earth,” he said. On Tuesday, Dr Lu will be joined at the B612 Foundation’s press conference in Seattle by Tom Jones, a four-time space shuttle astronaut and president of the Association of Space Explorers. Also present will be Bill Anders, a member of the three-strong Apollo 8 crew that in 1968 became the first to fly around the Moon. Mr Anders’ famous “Earthrise” photograph, which gave mankind its first ever glimpse of a fragile Earth rising over the Moon’s crater-strewn surface, will provide the backdrop. Posted on April 19, 2014 by richluscombe. This entry was tagged apollo, asteroid, nasa, space. Bookmark the permalink.